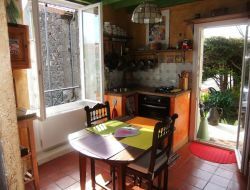 Holiday cottage situated in the countryside, near the Park of the Volcanoes of Auvergne, Vulcania, Puy de Dôme, Volvic and Sancy. Independent, recent house, completely equipped for 5 people. Free internet wifi, private car park, enclosed ground, garden. Highway in 10mn. Gone hiking, bathings, visits and the pure open air!. 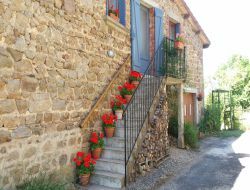 Holiday cottage of charm close to Issoire, classified village Arts and History. Vine grower house with closed garden and magnificent view on the castle. Numerous roads of gone hiking leaving of the holiday cottage. 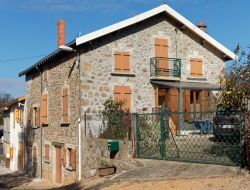 In 10mn from Issoire, close to Vulcania, Clermont Ferrand and to the Basilica st Julien de Brioude... Holiday cottage close to the village and all shops. 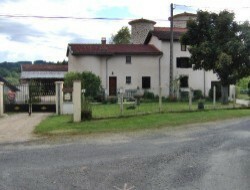 Welcome to the Gite de la Bichonette, classified 4 stars and accessible to people in wheelchairs. 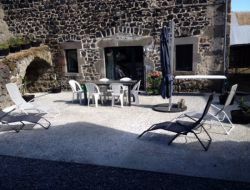 A nice shaded terrace, you will relax between two sessions of discovery of Puy de Dome and Auvergne. Holiday cottage in Auvergne, 20 km from Vulcania, Mont-Dore, with a beautiful view of the chain of Puys. Chalet opened in 2016, classified 3 stars, with all the comfort, 2 bedrooms with double beds and a cabin in the entrance with two single beds. Outside, an enclosed ground of 300m ² with a terrace, a garden furniture and a barbecue. Renting a separate apartment of 80m² on the ground floor of a typical house of the 19th of Auvergne, fully renovated. 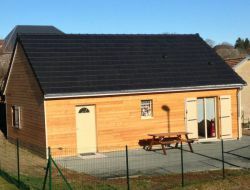 Holiday rental south-facing side to the chain of Sancy in a green setting ideal for nature lovers. The holiday cottage is situated in the countryside in a small historic hamlet in 1 km from the lake of Aubusson d'Auvergne, at feet of a very beautiful fortress of the XIIth century. Seen on the mounts of Forez and of the Grün du Chignore. Capacity 5 pers. 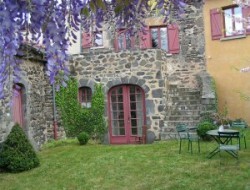 Cottage of character in Auvergne, located within a large closed and raised court. The cottage adjoins the owners' house with direct views of two volcanoes including the Gour de Tazenat. A relaxation area is at your disposal at the entrance to the vegetable garden.